The story of the Quiet Beatle, who was much more than that. Martin Scorsese's BBC documentary George Harrison: Living In The Material World is slated to be a wide-ranging biography that will examine his impact as an artist on the world and the world's impact on him. After obtaining permission from Harrison's family to make the film, Scorsese and his team created the project from archival footage, some of it unseen, and interviews with many important people from Harrison's life, such as Paul McCartney, Ringo Starr, Yoko Ono, Olivia and Dhani Harrison, Patti Boyd, Eric Clapton, and Eric Idle. Scorsese has proven himself to be a very talented documentarian with films like Italianamerican, where his parents were the subjects; My Voyage to Italy, an overview of Italian cinema with an emphasis on the films that had a strong influence on Scorsese; and No Direction Home, which traced the beginning of Bob Dylan's career until his 1966 "retirement". When speaking with The Hollywood Reporter, Scorsese said, "George Harrison's music and his search for spiritual meaning is a story that resonates today...His music is very important to me, so I was interested in the journey that he took as an artist. The film is an exploration." To help explain me Harrison's importance, I decided to get a little help from my friends. I can barely contain my excitement. I'm not going to revise history and tell you Harrison has always been my favorite Beatle but a few years ago I began an in-depth investigation into the solo catalogs of the Fab 4 and Harrison's understated ways rooted themselves deeply into a special place in my heart. There is a sweetness and charm that comes through in much of his work despite a perception that he could be quiet, brooding, or grumpy. His voice could be thin and he wasn't a consistent songwriter but his best work stands alongside that of anyone, Beatle or not. He was also an extraordinary guitarist, not because of dazzling virtuosity but because of his economical, lyrical lead lines. I'm eager to see this film to see, hear, and learn more about a man whose music continues to have a profound impact on me. It's not surprising that Martin Scorsese found George Harrison a suitable subject for a full-length documentary, as he remains one of the most complex figures in rock 'n' roll. He both loved and loathed being a Beatle; he was capable of producing beautiful, heartfelt love songs ("Something," "Blow Away") and biting commentaries ("Piggies," "Sue Me, Sue You Blues"); and he was at once spiritual and hedonistic. In a relatively short amount of time, Harrison transformed into a first-class songwriter; just compare "Don't Bother Me" to "Taxman" to experience his rapid artistic development. In addition, his unique guitar solos—particularly the "slide guitar" sound—distinguish his recordings from many other rock musicians. Up to his death in 2001, he continued to record quality music, as evidenced by his last work, Brainwashed. "None of life's strings can last/So, I must be on my way," he sang on 1970's "All Things Must Pass"; unfortunately, Harrison left us all too soon. He may have been dubbed the "Quiet Beatle" in the early 1960s, but his vast legacy speaks volumes. 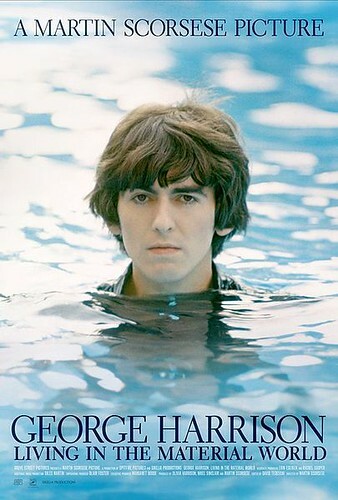 George Harrison: Living In The Material World runs 208 minutes. It will be shown at the 2011 New York Film Festival and will air on HBO in two parts on Oct 5th & 6th.